“My friend Erika and I went together for three weeks to the project in San Miguel. Going in, we weren’t quite sure what to expect, but we were both beyond satisfied with our time there. We actually wished we could have stayed there long-term to work on a research project. So, our two-week stay was filled with learning, volunteer work, and the beginnings of scientific studies that the project leaders were starting after the new year. The work that the organization is doing is incredible. They just closed a deal on buying more hectares of reserve land, and now have about 100 hectares for conservation use near Batan. Because our stay was short, our contribution was limited. 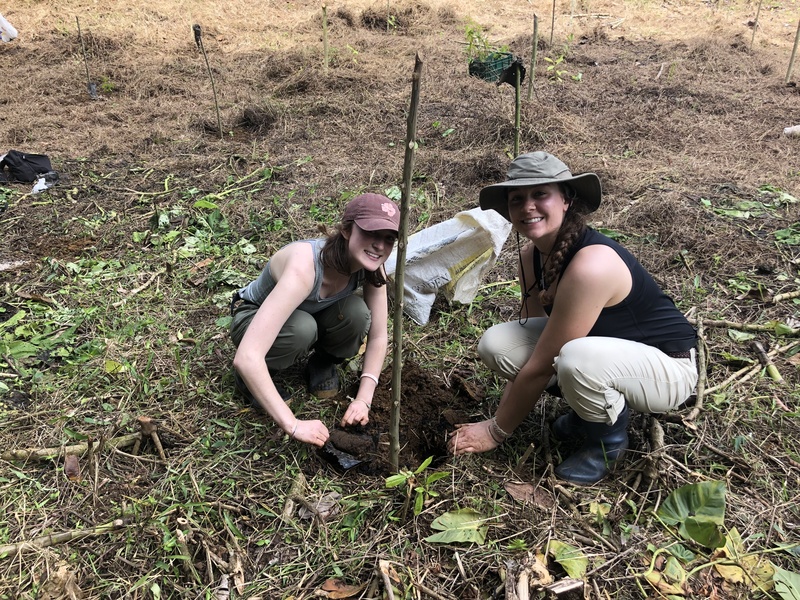 However, we were able to help Maarten, Hanneke, and the long-term student interns with their reforestation and biodiversity projects. We also helped around the farm with maintenance, including raking, cleaning, and harvesting certain fruits. Overall, it was a well-rounded and inspiring experience learning about the culture and wildlife of the area, and why it’s important to salvage it. Me and Erika’s only real challenge was figuring out the bus system to get to the project. We also were a bit confused in the beginning about who Matthijs was and who Maarten was. After being in the jungle, with limited service and Wi-Fi, we see how there is a communication challenge. However, I recommend to anyone thinking about taking this opportunity, to book an overnight with Robert from the Turtle Saving Hostel in San Jose after their flight. He guided us through the steps to get to Batan and helped us communicate with Maarten for our pick up. Everything was smooth, and travel was a lot easier than I expected, even with barely any knowledge in speaking Spanish. Join an organisation you’ll be proud of!